This article is about the 17th century civil war in France. For other uses, see Fronde (disambiguation). Battle of the Faubourg St Antoine by the Walls of the Bastille, Paris. The Fronde (French pronunciation: ​[fʁɔ̃d]); was a series of civil wars in France between 1648 and 1653, occurring in the midst of the Franco-Spanish War, which had begun in 1635. The word fronde means sling, which Parisian mobs used to smash the windows of supporters of Cardinal Mazarin. The Fronde was divided into two campaigns, the Fronde of the parlements and the Fronde of the nobles. The timing of the outbreak of the Fronde des parlements, directly after the Peace of Westphalia (1648) that ended the Thirty Years War, was significant. The nuclei of the armed bands that terrorized parts of France under aristocratic leaders during this period had been hardened in a generation of war in Germany, where troops still tended to operate autonomously. Louis XIV, impressed as a young ruler with the experience of the Fronde, came to reorganize French fighting forces under a stricter hierarchy whose leaders ultimately could be made or unmade by the King. Thus the Fronde finally resulted in the disempowerment of the territorial aristocracy and the emergence of absolute monarchy. 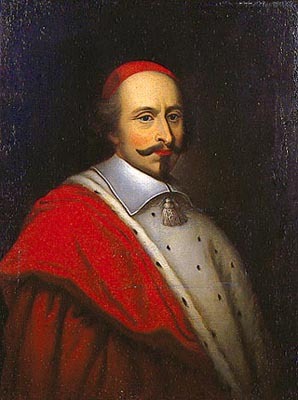 Cardinal Mazarin, French diplomat and statesman, by Pierre-Louis Bouchart. The insurrection did not start with revolutionary goals; it aimed to protect the ancient liberties from royal encroachments and to defend the established rights of the parlements - courts of appeals rather than legislative bodies like the English parliaments - and especially the right of the Parlement of Paris to limit the king's power by refusing to register decrees that ran against custom. The liberties under attack were feudal, not of individuals, but of chartered towns, where they defended the prerogatives accorded to offices in the legal patchwork of local interests and provincial identities that was France. The Fronde in the end provided an incentive for the establishment of royalist absolutism, since the disorders eventually discredited the feudal concept of liberty. The pressure that saw the traditional liberties under threat came in the form of extended and increased taxes as the Crown needed to recover from its expenditures in the recent wars. The costs of the Thirty Years War (1618-1648) constrained Mazarin's government to raise funds by traditional means, the impôts, the taille, and the occasional aides. The nobility refused to be so taxed, based on their old liberties, or privileges, and the brunt fell upon the bourgeoisie. The movement soon degenerated into factions, some of which attempted to overthrow Mazarin and to reverse the policies of his predecessor Cardinal Richelieu (in office 1624-1642) who had taken power for the crown from great territorial nobles, some of whom became leaders of the Fronde. When Louis XIV became king in 1643, he was only a child, and though Richelieu had died the year before, his policies continued to dominate French life under his successor Cardinal Mazarin. Most historians[which?] believe that Louis's later insistence on absolutist rule and depriving the nobility of actual power was a result of these events in his childhood. The term frondeur was later used to refer to anyone who suggested that the power of the king should be limited, and has now passed into conservative French usage to refer to anyone who will show insubordination or engage in criticism of the powers in place. In May 1648 a tax levied on judicial officers of the Parlement of Paris provoked not merely a refusal to pay but also a condemnation of earlier financial edicts and a demand for the acceptance of a scheme of constitutional reforms framed by an united committee of the parlement (the Chambre Saint-Louis), composed of members of all the sovereign courts of Paris. The military record of the first Fronde (the Fronde Parlementaire) is almost blank. In August 1648, feeling strengthened by the news of the Prince of Condé's victory at Lens (20 August 1648), Mazarin suddenly arrested the leaders of the parlement, whereupon Paris broke into insurrection and barricaded the streets. The noble faction demanded the calling of an assembly of the États-généraux (last convoked in 1615). The nobles believed that in the États-généraux they could continue to control the bourgeois element as they had in the past. The royal faction, having no army at its immediate disposal, had to release the prisoners and promise reforms - on the night of October 22 it fled from Paris. But France's signing of the Peace of Westphalia (Treaty of Münster, 24 October 1648) allowed the French army to return from the frontiers, and by January 1649 Condé had put Paris under siege. The two warring parties signed the Peace of Rueil (11 March 1649) after little blood had been shed. The Parisians, though still and always anti-cardinalist, had refused to ask for Spanish aid, as proposed by their princely and noble adherents under Conti, and having no prospect of military success without such aid, the noble party submitted to the government and received concessions. From then on the Fronde became a story of intrigues, half-hearted warfare in a scramble for power and control of patronage, losing all trace of its first constitutional phase. The leaders were discontented princes and nobles: Gaston of Orleans (the king's uncle); the great Louis II, Prince de Condé and his brother Armand, Prince of Conti; Frédéric, the Duke of Bouillon, and his brother Henri, Viscount of Turenne. To these must be added Gaston's daughter, Mademoiselle de Montpensier (La grande Mademoiselle); Condé's sister, Madame de Longueville; Madame de Chevreuse; and the astute intriguer Jean François Paul de Gondi, the future Cardinal de Retz. The military operations fell into the hands of war-experienced mercenaries, led by two great, and many lesser, generals. The peace of Rueil lasted until the end of 1649. The princes, received at court once more, renewed their intrigues against Mazarin. On January 14, 1650, Cardinal Mazarin, having come to an understanding with Monsieur Gondi and Madame de Chevreuse, suddenly arrested Condé, Conti, and Longueville. The war which followed this coup is called the "Princes' Fronde". This time it was Turenne, before and afterwards the most loyal soldier of his day, who headed the armed rebellion. Listening to the promptings of Madame de Longueville, he resolved to rescue her brother Condé, his old comrade in the battles of Freiburg and Nördlingen. Turenne hoped to do this with Spanish assistance; a powerful Spanish army assembled in Artois under the archduke Leopold Wilhelm, governor-general of the Spanish Netherlands. But peasants of the countryside rose against the invaders; the royal army in Champagne was in the capable hands of Caesar de Choiseul, comte du Plessis-Praslin, who counted 52 years of age and 36 of war experience; and the little fortress of Guise successfully resisted the archduke's attack. At that point Mazarin drew upon Plessis-Praslin's army for reinforcements to be sent to subdue the rebellion in the south forcing the royal general to retire. Then Archduke Leopold Wilhelm decided that he had spent enough of the king of Spain's money and men in the French quarrel. His regular army withdrew into winter quarters, and left Turenne to deliver the princes with a motley host of Frondeurs and Lorrainers. Plessis-Praslin by force and bribery secured the surrender of Rethel on December 13, 1650, and Turenne, who had advanced to relieve the place, fell back hurriedly. But he was a terrible opponent, and Plessis-Praslin and Mazarin himself, who accompanied the army, had many misgivings as to the result of a lost battle. The marshal chose nevertheless to force Turenne to a decision, and the Battle of Blanc-Champ (near Somme-Py) or Rethel was the consequence. Both sides were at a standstill in strong positions, Plessis-Praslin doubtful of the trustworthiness of his cavalry, but Turenne was too weak to attack, when a dispute for precedence arose between the Gardes Françaises and the Picardie regiment. The royal infantry had to be rearranged in order of regimental seniority, and Turenne, seeing and desiring to profit by the attendant disorder, came out of his stronghold and attacked with the greatest vigor. The battle (December 15, 1650) was severe and for a time doubtful, but Turenne's Frondeurs gave way in the end, and his army, as an army, ceased to exist. Turenne himself, undeceived as to the part he was playing in the drama, asked and received the young king's pardon, and meantime the court, with the maison du roi and other loyal troops, had subdued the minor risings without difficulty. (March–April 1651). Condé, Conti, and Longueville were released, and by April 1651 the rebellion had everywhere collapsed. Then followed a few months of hollow peace and the court returned to Paris. Mazarin, an object of hatred to all the princes, had already retired into exile. His absence left the field free for mutual jealousies, and for the remainder of the year anarchy reigned in France. In December 1651 Cardinal Mazarin returned to France with a small army. The war began again, and this time Turenne and Condé were pitted against one another. After this campaign the civil war ceased, but in the several other campaigns of the Franco-Spanish War that followed, the two great soldiers were opposed to one another, Turenne as the defender of France, Condé as a Spanish invader. The début of the new Frondeurs took place in Guyenne (February–March 1652), while their Spanish ally, the archduke Leopold Wilhelm, captured various northern fortresses. On the Loire, where the centre of gravity was soon transferred, the Frondeurs were commanded by intriguers and quarrelsome lords, until Condé's arrival from Guyenne. His bold leadership made itself felt in the Bléneau (April 7, 1652), in which a portion of the royal army was destroyed; but fresh troops came up to oppose him. From the skillful dispositions made by his opponents, Condé felt the presence of Turenne and broke off the action. The royal army did likewise. Condé invited the commander of Turenne's rearguard to supper, chaffed him unmercifully for allowing the prince's men to surprise him in the morning, and by way of farewell remarked to his guest, "Quel dommage que de braves gens comme nous se coupent la gorge pour un faquin" ("It's too bad decent people like us are cutting our throats for a scoundrel")—an incident and a remark that displayed the feudal arrogance which ironically led to the iron-handed absolutism of Louis XIV. After Bléneau, both armies marched to Paris to negotiate with the parlement, de Retz and Mlle de Montpensier, while the archduke took more fortresses in Flanders, and Charles, duke of Lorraine, with an army of plundering mercenaries, marched through Champagne to join Condé. As to the latter, Turenne maneuvered past Condé and planted himself in front of the mercenaries, and their leader, not wishing to expend his men against the old French regiments, consented to depart with a money payment and the promise of two tiny Lorraine fortresses. A few more maneuvers, and the royal army was able to hem in the Frondeurs in the Faubourg St. Antoine (July 2, 1652) with their backs to the closed gates of Paris. The royalists attacked all along the line and won a signal victory in spite of the knightly prowess of the prince and his great lords, but at the critical moment Gaston's daughter persuaded the Parisians to open the gates and to admit Condé's army. She herself turned the guns of the Bastille on the pursuers. An insurrectionist government was organized[by whom?] in the capital and proclaimed Monsieur lieutenant-general of the realm. Mazarin, feeling that public opinion was solidly against him, left France again, and the bourgeois of Paris, quarrelling with the princes, permitted the king to enter the city on October 21, 1652. Mazarin returned unopposed in February 1653. Reception of the Grand Condé at Versailles following his victory at Seneffe. The Grand Condé advances towards Louis XIV in a respectful manner with laurel wreaths on his path, while captured enemy flags are displayed on both sides of the stairs. It marked the end of Condé's exile, following his participation to the Fronde. The Fronde as a civil war was now over. The whole country, wearied of anarchy and disgusted with the princes, came to look to the king's party as the party of order and settled government, and thus the Fronde prepared the way for the absolutism of Louis XIV. The general war continued in Flanders, Catalonia, and Italy wherever a Spanish and a French garrison were face to face, and Condé, with the wreck of his army, openly and defiantly entered the service of the king of Spain. This "Spanish Fronde" was almost purely a military affair. In 1653 France was so exhausted that neither invaders nor defenders were able to gather supplies to enable them to take the field till July. At one moment, near Péronne, Condé had Turenne at a serious disadvantage, but he could not galvanize the Spanish general Count Fuensaldana, who was more solicitous to preserve his master's soldiers than to establish Condé as mayor of the palace to the king of France, and the armies drew apart again without fighting. In 1654 the principal incident was the siege and relief of Arras. On the night of August 24–August 25 the lines of circumvallation drawn round that place by the prince were brilliantly stormed by Turenne's army, and Condé won equal credit for his safe withdrawal of the besieging corps under cover of a series of bold cavalry charges led by himself as usual, sword in hand. In 1655 Turenne captured the fortresses of Landrecies, Condé and St Ghislain. In 1656 the prince of Condé avenged the defeat of Arras by storming Turenne's circumvallation around Valenciennes (July 16), but Turenne drew off his forces in good order. The campaign of 1657 was uneventful, and is only to be remembered because a body of 6,000 English infantry, sent by Cromwell in pursuance of his treaty of alliance with Mazarin, took part in it. The presence of the English contingent and its very definite purpose of making Dunkirk a new Calais, to be held by England forever, gave the next campaign a character of certainty and decision which was entirely wanting in the rest of the war. Dunkirk was besieged promptly and in great force, and when Don Juan of Austria and Condé appeared with the relieving army from Fumes, Turenne advanced boldly to meet them. The Battle of the Dunes, fought on June 14, 1658, was the first real trial of strength since the battle of the Faubourg St Antoine. Successes on one wing were compromised by failure on the other, but in the end Condé drew off with heavy losses, the success of his own cavalry charges having entirely failed to make good the defeat of the Spanish right wing amongst the Dunes. Here the "red-coats" made their first appearance on a continental battlefield, under the leadership of Sir William Lockhart, Cromwell's ambassador at Paris. They astonished both armies by the stubborn fierceness of their assaults, for they were the products of the English Civil War, where passions ran higher and the determination to win rested on deeper foundations than did the deteriorating feudal spirit of the main parties who, after decades of war, had been sapped of all belief. Dunkirk fell, and was handed over to the English Protectorate, as promised, so flying the St George's Cross until Charles II sold it to the king of France in 1662. A last desultory campaign followed in 1659—the twenty-fifth year of a conflict between France and Spain which had begun during the Thirty Years' War—and the peace of the Pyrenees was signed on November 5. On January 27, 1660 the prince asked and obtained at Aix-en-Provence the forgiveness of Louis XIV. The later careers of Turenne and Condé were as obedient subjects of their sovereign. ↑ 1.0 1.1 1.2 1.3 1.4 1.5 1.6 Atkinson 1911, p. 247. ↑ Atkinson 1911, pp. 247, 248. ↑ 3.00 3.01 3.02 3.03 3.04 3.05 3.06 3.07 3.08 3.09 3.10 3.11 Atkinson 1911, p. 248. ↑ Atkinson 1911, pp. 248, 249.